We have already discussed the construction of underground cables in the previous article. 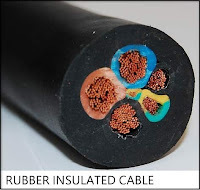 In this article, we will discuss the different types of cable insulation materials used in underground power cables. Insulation is a non-conductive material, or a material resistant to the flow of electric current. It is often called a dielectric in radio frequency cables. 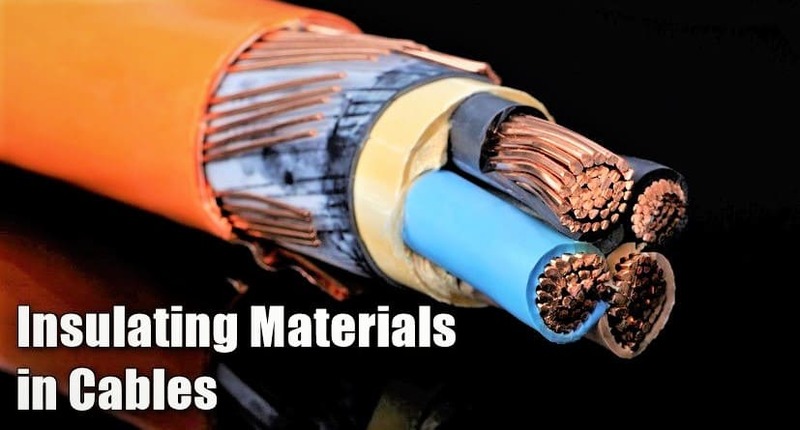 Insulation resists electrical leakage, prevents the wire’s current from coming into contact with other conductors, and preserves the material integrity of the wire by protecting against environmental threats such as water and heat. Both the safety and effectiveness of the wire depend on its insulation. 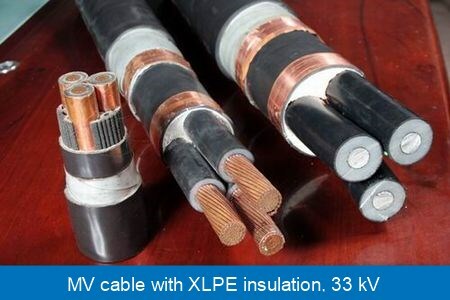 The satisfactory operation of a cable depends to a great extent upon the characteristics of insulation used. Therefore, the proper choice of insulating material for cables is of considerable importance. High insulation resistance to avoid leakage current. 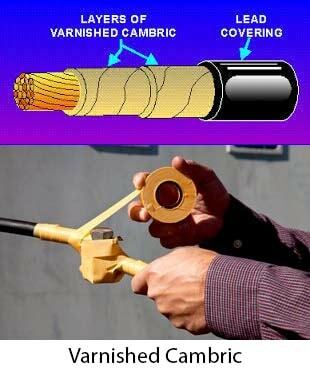 High dielectric strength to avoid electrical breakdown of the cable. High mechanical strength to withstand the mechanical handling of cables. Non-hygroscopic i.e., it should not absorb moisture from air or soil. 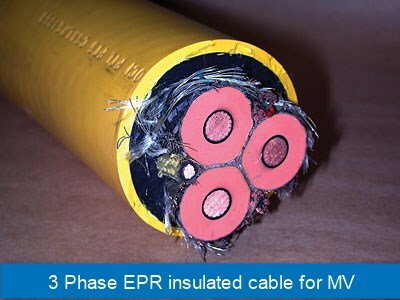 The moisture tends to decrease the insulation resistance and hastens the breakdown of the cable. In case the insulating material is hygroscopic, it must be enclosed in a waterproof covering like the lead sheath. Low cost so as to make the underground system a viable proposition. No one insulating material possesses all the above-mentioned properties. Therefore, the type of insulating material to be used depends upon the purpose for which the cable is required and the quality of insulation to be aimed at. The principal insulating materials used in cables are rubber, vulcanized India rubber, impregnated paper, varnished cambric, and polyvinyl chloride. Rubber may be obtained from the milky sap of tropical trees or it may be produced from oil products. It has relative permittivity varying between 2 and 3, dielectric strength is about 30 kV/mm and resistivity of insulation is 1017 Ω cm. Although pure rubber has reasonably high insulating properties, it suffers from some major drawbacks viz., readily absorbs moisture, maximum safe temperature is low (about 38ºC), soft and liable to damage due to rough handling and ages when exposed to light. Therefore, pure rubber cannot be used as an insulating material. It is prepared by mixing pure rubber with mineral matter such as zinc oxide, red lead etc., and 3 to 5% of sulfur. The compound so formed is rolled into thin sheets and cut into strips. The rubber compound is then applied to the conductor and is heated to a temperature of about 150ºC. The whole process is called vulcanization and the product obtained is known as vulcanized India rubber. Vulcanized India rubber has greater mechanical strength, durability and wears resistant property than pure rubber. Its main drawback is that sulfur reacts very quickly with copper and for this reason, cables using VIR insulation have a tinned copper conductor. The VIR insulation is generally used for low and moderate voltage cables. It consists of chemically pulped paper made from wood chippings and impregnated with some compound such as paraffinic or naphthenic material. This type of insulation has almost superseded the rubber insulation. It is because it has the advantages of low cost, low capacitance, high dielectric strength, and high insulation resistance. The only disadvantage is that paper is hygroscopic and even if it is impregnated with a suitable compound, it absorbs moisture and thus lowers the insulation resistance of the cable. 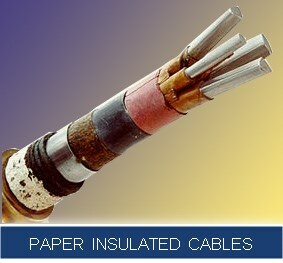 For this reason, paper insulated cables are always provided with some protective covering and are never left unsealed. If it is required to be left unused on the site during laying, its ends are temporarily covered with wax or tar. For instance, they can be profitably used for distribution at low voltages in congested areas where the joints are generally provided only at the terminal apparatus. However, for smaller installations, where the lengths are small and joints are required at a number of places, VIR cables will be cheaper and durable than paper insulated cables. It is a cotton cloth impregnated and coated with varnish. This type of insulation is also known as empire tape. The cambric is lapped on to the conductor in the form of a tape and its surfaces are coated with petroleum jelly compound to allow for the sliding of one turn over another as the cable is bent. As the varnished cambric is hygroscopic, therefore, such cables are always provided with a metallic sheath. Its dielectric strength is about 4 kV/mm and permittivity is 2.5 to 3.8. This insulating material is a synthetic compound. It is obtained from the polymerization of acetylene and is in the form of white powder. 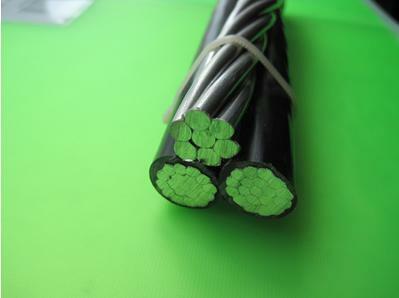 For obtaining this material as cable insulation, it is compounded with certain materials known as plasticizers which are liquids with high boiling point. The plasticizer forms a gell and renders the material plastic over the desired range of temperature. Polyvinyl chloride has high insulation resistance, good dielectric strength and mechanical toughness over a wide range of temperatures. It is inert to oxygen and almost inert to many alkalies and acids. Therefore, this type of insulation is preferred over VIR in extreme environmental conditions such as in cement factory or chemical factory. As the mechanical properties (i.e., elasticity etc.) 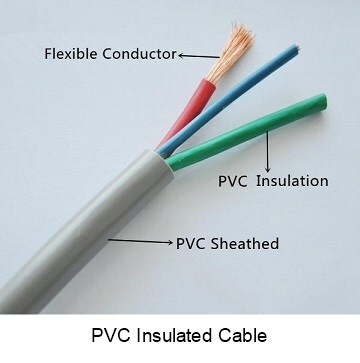 of PVC are not so good as those of rubber, therefore, PVC insulated cables are generally used for low and medium domestic lights and power installations. It is cheap, durable and widely available. However, the chlorine in PVC (a halogen) causes the production of thick, toxic, black smoke when burnt and can be a health hazard in areas where low smoke and toxicity are required (e.g. confined areas such as tunnels). Normal operating temperatures are typically between 75ºC and 105ºC (depending on PVC type). Temperature limit is 160ºC (<300mm2) and 140ºC (>300mm2). PVC and polyethylene are thermoplastic materials which means that they go soft when heated and harden when cooled. The most common thermoplastic material is PVC. Another one is polyethylene. PE is part of a class of polymers called polyolefins. Polyethylene has lower dielectric losses than PVC and is sensitive to moisture under voltage stress (i.e. for high voltages only). This compound is used most in coaxial and low capacitance cables because of its exemplary electric qualities. Many times it is used in these applications because it is affordable and can be foamed to reduce the dielectric constant to 1.50, making it an attractive option for cables requiring high-speed transmission. Polyethylene can also be cross-linked to produce high resistance to cracking, cut-through, soldering, and solvents. Polyethylene can be used in temperatures ranging from -65°C to 80°C. All densities of Polyethylene are stiff, hard, and inflexible. The material is also flammable. Additives can be used to make it flame retardant, but this will sacrifice the dielectric constant and increase power loss. XLPE has different polyethylene chains linked together (“cross-linking”) which helps prevent the polymer from melting or separating at elevated temperatures. Therefore XLPE is useful for higher temperature applications. XLPE has higher dielectric losses than PE but has better aging characteristics and resistance to water treeing. Normal operating temperatures are typically between 90ºC and 110ºC. Temperature limit is 250ºC. EPR is a copolymer of ethylene and propylene and commonly called an “elastomer”. EPR is more flexible than PE and XLPE but has higher dielectric losses than both. Normal operating temperatures are typically between 90C and 110C. Temperature limit is 250C.